Asking clients to recommend your business is a great way to boost your credibility online. But if you’re not in the habit of asking for reviews, how do you go about doing it? For the past couple of years, I’ve focused on asking clients for testimonials on LinkedIn – and I now have over 100 recommendations for everything from ongoing marketing support to website copywriting. You just spent a fabulous weekend in London, at a gorgeous hotel with attentive, friendly service, soft, fluffy towels and city views to die for. Chances are you found that hotel by reading traveller reviews on a site such as TripAdvisor or Booking.com. Most of us choose our holidays, our cars and the movies we watch on the strength of reviews written by other people. We book dinner at restaurants we’ve read about on Google, and never buy anything from Amazon without first checking the reviews. We live in a culture where we love to share our experiences – good or bad – to help other people make the right choices. Reviews and recommendations shape our lives and influence the decisions we make. Given a list of three builders, we pick the one who built that incredible extension for the guy up the road. As for graphic designers… did you see how many people have recommended that freelancer in Cheltenham? He must be great! Recommendations tell other people that we know our stuff. We deliver. We’re credible. We’re creative. We add value. We make their lives easier. We’re fun to work with. In his 1984 book, Influence, Robert Cialdini lists social proof as one of his six principles of persuasion. When more people are doing something, we feel a compulsion to follow suit. And therein lies the value of the humble testimonial. Here are my top tips for using online reviews to make your business more successful. When’s the best time to ask for a recommendation? Most clients will be happy to recommend your business if you’ve provided great service. It’s best to ask for an online review soon after you’ve finished a project, while the experience of working with you is still fresh in their mind. Which reviews should I ask for? Whether you should focus on encouraging customers to review you on Google, TripAdvisor, Trustpilot, Facebook or LinkedIn depends on preference and the type of business you run. For example, TripAdvisor tends to be the first port of call for hotels and restaurants, Trustpilot is popular with tradespeople, while LinkedIn is popular among professionals. Rather than diluting your efforts and getting a few results across a range of channels, focusing your efforts on one channel can get the best results. How do I ask my customers to recommend me? Whichever channel you decide to focus on, send clients and customers a direct link to the review page of the site with a short, friendly note asking if they’d mind taking the time to review your business. If you can ask them in person, even better! If you’re not used to asking for feedback it might feel uncomfortable the first time you do it, but once you get into the habit it’ll soon become second nature. How do I ask for a recommendation on LinkedIn? In the search button, top left, type in the name of the person you want to ask for a recommendation. Use the down arrows on the right to select your relationship. For example: “Claire was a client of mine”. Select your position at the time of working with them (hint: it’s usually the top option). Personalise the recommendation request, and hit send. Until now, I’d never thought of asking a client to review me on Google, but with studies proving that Google reviews can help to catapult your business to the top of Google search results, asking for Google reviews is on my action list for 2019. How do I ask for a five-star Google review? Type your business name into Google – not the URL to your website – as if you were a customer searching for your business. Scroll down to find the button that says Write a review and click this button. Copy the lengthy URL to this page. Use a URL shortener such a Bitly to create a more user-friendly URL. (Google’s own URL shortener is being discontinued in March 2019). Save your shortened link somewhere safe so you can use it again and again (I texted mine to myself and copied it into Evernote – whatever works for you). Email recent clients inviting them to leave you a Google review, and remember to include the shortened link to make it super straightforward. Use them for your own marketing Quotes can be used to spice up your website, provide content for your social media accounts, or as the basis for case studies to showcase the value of your services. Get noticed online Reviews and recommendations – particularly Google reviews – can help drive your business to the top of search results online. Get real Online reviews are a great way to keep track of the things your customers love – and hate – about your business, your products or your services. 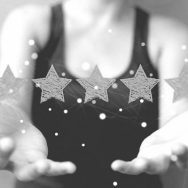 See negative reviews as a chance to improve your service, not a reason for despair – and always respond politely and promptly. Give yourself a boost Bad day? Lost confidence? Read your customer testimonials to remind yourself of why you do what you do – and just how good you are at it. Most of us are happy to share our experiences, and your clients are no exception – so start turning them into online advocates for your business and building up your online reviews. You’ll soon notice the results.